Identifying nontarget crop and ornamental plant damage from herbicides has become much easier with the launch of a new online photo repository by the Statewide IPM Program, University of California Division of Agriculture and Natural Resources. Herbicides applied to manage weeds may move from the site where it was applied in the air or by attaching to soil particles and traveling as herbicide-contaminated soil. When an herbicide contacts a nontarget plant, a plant it was not intended to contact, it can cause slight to serious injury. Herbicide injury also occurs when the sprayer is not properly cleaned after a previous herbicide application. Herbicide residue can be found in the spray tank, spray lines, pumps, filters and nozzles so a sprayer must be thoroughly cleaned after an application. Dry herbicide particles can be redissolved months later and cause herbicide damage to plants. Economic damage includes reduced yield, poor fruit quality, distorted ornamental or nursery plants, and occasionally plant death. Accurately diagnosing plants that may have herbicide injuries is difficult. In many cases, herbicide symptoms look very similar to symptoms caused by diseases, nutrient deficiencies, environmental stress and soil compaction. Plant disease symptoms such as mottled foliage, brown spots or stem death and plant pests such as insects or nematodes cause foliage to yellow and reduce plant growth similar to herbicide injury. Dr. Kassim Al-Khatib, weed science professor at UC Davis and director of the UC Statewide Integrated Pest Management Program (UC IPM), has gathered nearly a thousand photos of herbicide-damaged plants, drawn from his own and others' research. 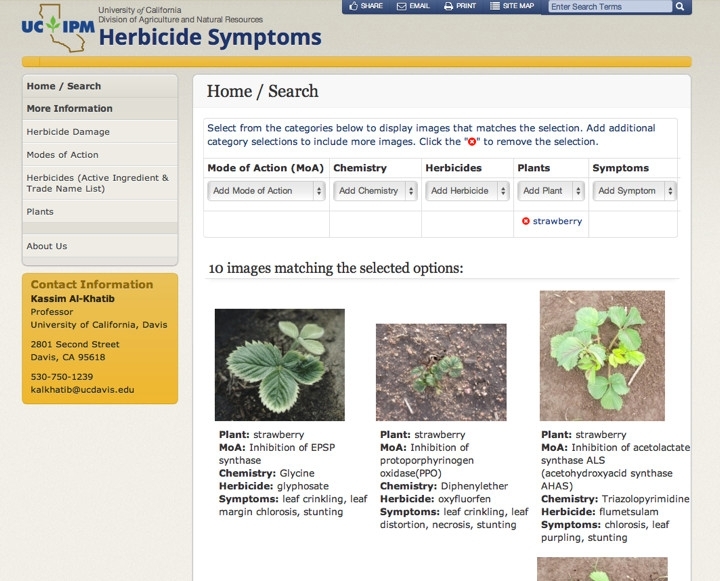 The images are cataloged to show damage that can occur from 81 herbicides in more than 14 specific herbicide modes of action, applied in the field to demonstrate the symptoms or when known herbicide spray has drifted onto the plant. Also included in the repository is information about the modes of action of various herbicides and an index of example herbicide trade names and active ingredients. Users can learn how unintended injury from herbicide occurs from misapplication and carryover from previous crops in addition to drift and herbicide-contaminated tanks. The repository can be found at http://herbicidesymptoms.ipm.ucanr.edu. Increased knowledge about what causes herbicide damage and how it occurs can lead to fewer cases of herbicide injury occurring through drift or herbicide-contaminated tanks. Using the repository can increase the skill to correctly identify plant damage. Correctly identifying damage as herbicide injury and not from a plant pest or nutrient deficiency can prevent unnecessary applications of pesticides or fertilizers. Fewer applications can lessen the risk of harm of pesticides and fertilizers to people and the environment.